I’m still trying to deal with losing Pokévision, too, but Niantic’s recent changes to the game don’t seem to be putting a damper on player appetite just yet — new data from analytics firm Sensor Tower reveals that users are still spending, on average, around 26 minutes per day in the app in the U.S., which is actually a slight increase compared to the average play duration the week prior to the update’s arrival. And yes, users are still opening the app about the same amount of time, too — around six times per day, for the most part. Sensor Tower’s sentiment analysis on the latest update also shows what I’ve heard anecdotally: People generally aren’t thrilled with the changes. But remember that one of the surest signs you’ve done something right in apps with significant uptake is that any changes are greeted with massive, primarily negative outcry. 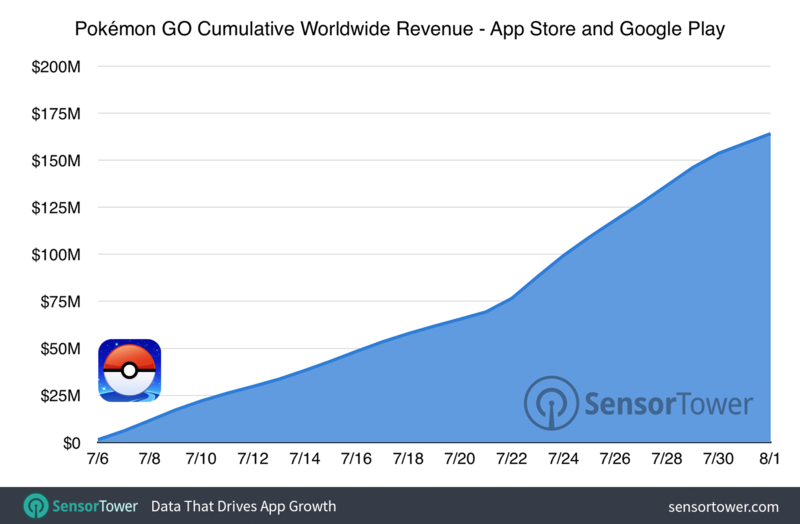 Meanwhile, users have also spent a pretty penny on various Poké-accoutrements during its less than 30 days of existence: Sensor Tower estimates about $160 million in total revenue, which makes sense given App Annie now says it’s netting about $10 million daily from its user pool, which has grown considerably since launch with the addition of new markets. While Nintendo is only going to see a relatively small direct upside from that net revenue figure, it’s benefiting in other ways from Go’s continued success: 3DS sales of the most recent Pokémon series installment for that platform have doubled since Go’s debut.